Under the Patronage of His Highness Sheikh Maktoum bin Mohammed bin Rashid Al Maktoum, Deputy Ruler of Dubai and President of Dubai International Financial Centre (DIFC), and in the presence of His Highness Sheikh Ahmed bin Saeed Al Maktoum, President of the Dubai Civil Aviation Authority, Chairman of Dubai Airports and Chairman and Chief Executive Emirates Airline Group; City University London held its graduation ceremony for the sixth cohort of Cass Business School’s Executive MBA programme in Dubai, where 51 students received their certificates. Over 250 people attended the ceremony at DIFC’s Conference Centre, along with their families, business leaders, and distinguished guests including His Excellency Abdulla Mohammed Saleh, member of the DIFC Higher Board, Mr Arif Amiri, Deputy CEO, DIFC Authority, Mr Abdulla bin Saeed bin Ahmed Lootah, member of board, S.S. Lootah Group, and Dr Warren Fox, Chief of Higher Education Department, Knowledge and Human Development Authority, who all came to see the students graduate from the Cass Executive MBA programme, a two-year course delivered in a monthly block weekend format to accommodate the busy working professional. During the ceremony, a letter of commendation was also presented to Haj Saeed Bin Ahmed Lootah, in recognition of his outstanding contribution to the development of Islamic Banking and Education Sectors in the United Arab Emirates and the wider region. His son Abdulla bin Saeed bin Ahmed Lootah was in attendance to receive the honour on his behalf. Entrepreneurship and innovation are key themes throughout Cass Business School’s Executive MBA programme in Dubai, and this year the themes helped to inspire graduate Sean Rutter to launch his executive recruitment firm, KWR, showing the real confidence and contribution Cass Business School’s EMBA provides for its students and the Emirate’s ambition to foster an innovation driven economy. Last year’s graduates included entrepreneur and one of Forbes magazine’s top 100 business leaders in the MENA region, Khalid Al-Qaqa, Group CEO, Shanghai Electric. His Excellency Essa Kazim, Governor of Dubai International Financial Centre said: “The UAE has declared 2015 as the Year of Innovation. The time is just right for bringing in new ideas and perspectives that can further enrich the nation’s dynamic business landscape. I am confident our young graduates will prove vital contributors to the UAE’s vision through drawing upon their fresh innovative thinking and putting their classroom learning to good use. 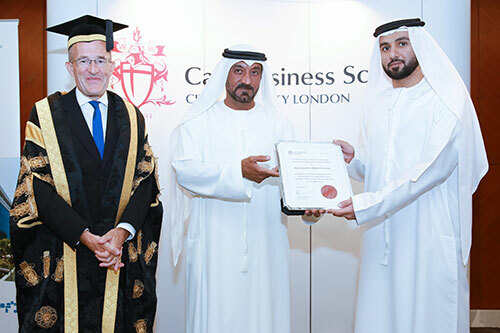 Professor Sir Paul Curran, Vice-Chancellor of City University London, commented: "City University London has established the Dubai Centre as an important hub for postgraduate education in business and related disciplines in the Middle East. It reflects the reputation the University enjoys for academic excellence for business and the professions. Over the last six years, our Executive MBA programme has contributed to the growth of the region's knowledge-based economy and strengthened the ties between the UAE and the UK. I am proud to recognise the outstanding achievements of our latest cohort of graduates and look forward to following their successes in global business, entrepreneurship and the professions”. 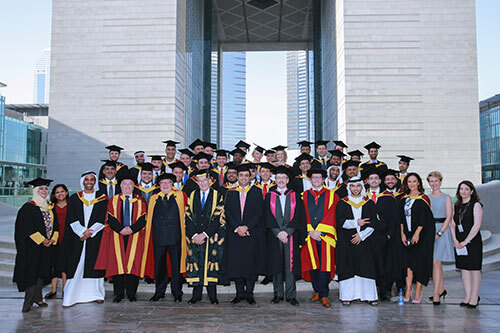 Ehsan Razavizadeh, Regional Director, MENA and Head of the Dubai Centre said: “On behalf of Cass Business School I would like to congratulate the Executive MBA programme students graduating today. Cass Business School’s research has gone from strength to strength over the past year, and it has been ranked among the leading institutions for business and management research in the UK. According to the Research Excellence results published by the Higher Education Funding Council for England, 84 per cent of Cass business and management research was rated as world-leading or internationally excellent. Cass Dubai’s EMBA was the first programme of its kind to offer specialist Islamic finance and energy modules, and it provides streams in general management and leadership, mainstream finance and entrepreneurship.